If you poke us, won’t we un-friend? if you tickle us, don’t we LOL? This sent me into peals of...well, LOL. Mark Twain must be looking down here and shaking his head. Oh the correctness of it all. Good thing these folks can't understand the original stories of Uncle Remus. They'd never be done blowing gaskets. "To Kill a Mockingbird" becomes "To End the Suffering of a Hapless Feathered Friend"
"The Grapes of Wrath" becomes "The Hanging Fruit of Unpleasant Reprisal"
"Ben Hur" becomes "Ben Him"
"The Prince and the Pauper" becomes "The Evil Rich Guy and the Poor Downtrodden but Proud Underclass Guy"
The arrogance of modern mankind never ceases to amaze me! 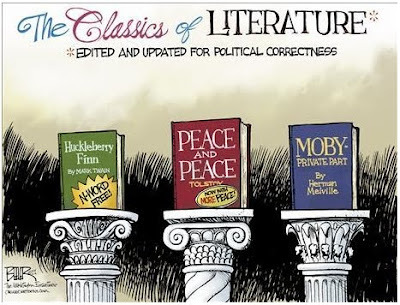 It is only arrogance that would lead someone to think we have to sanitize (for today's political correctness, no less) classic literature. Ugh! Anonymous Patriot, I am still laughing at your revised titles! It looks like you have a new career ahead of you!! Salt Creek holds a lot of salty water out here. I am kidding of course. The Salt Creek in my town has a predominate role in how history played out around here. I'm sure it's only coincidence that Paul Wald uses that handle for his website. There must be lots of Salt Creeks. The self-righteous actions of liberals has just about gone far enough. This isn't the arrogance of "modern mankind." It's the arrogance of our progressive, politically correct, morally devoid liberals! We all know the truth, as do they. But they self-centeredly choose to ignore the truth, because they think they know better than everyone else. It's been this way since man first defied God. Liberals wouldn't listen to Jesus. Do you think they'll listen to US? We must stop trying to reason with them and rally behind honest, honorable folks like Patrice. Ignore the lost cause liberals and concentrate on rallying conservatives everywhere! God bless us all. hope it doesn't happen to my louis la more or my zane grey stories...course, ya gotta pretty much understand the cowboy dialect first before correcting 'em. still, it is a great tragedy to change even one word of classics. I listened to your interview with Mr. Wald. You have a pleasant voice for broadcasting. There was a lot of information in that. I always knew that my grandmother did not get the credit she had coming for handling those cows day in and day out. Thankyou Patrice for bringing me up to speed. Thank you, Anon 4:48! Paul was great - the interview was a lot of fun. No doubt they didn't change one G**D*** in the book to something less offensive. That was the only thing about that book that I was actually offended by, but you know what? I never made a stink about it in class. I chose to not read it and took the grade I got without making a peep. It would take more elucidation than I will attempt here, but I fear political correctness will be at the root of the undoing of our great republic.